Click on the stained glass window to see some of the church's other windows. 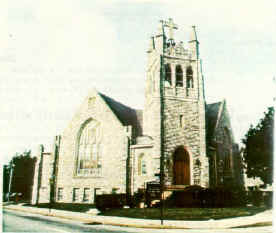 Since 1996 this building at 18th Street & Providence Avenue has been the home of the Asbury AME Church. 600 E Dutton Mill Rd. A number of years ago there was a robbery at Providence Avenue. The safe, containing the church record books, was removed from the church and when found it was determined that much of the church records were missing and that which remained were water stained and damaged. It is these remaining records that are at Old St. Georges. Church History The following articles and list of significant events in the history of Providence Avenue Methodist Church were contributed by Mark Christy, mark1christy@netzero.net, from the church's memorial booklet created and compiled by Idaroxie Luttrelle Koerner and Gary F. Koerner in 1994. August 25, 1887: Cornerstone laid for the first Church (remembered as the chapel). January 8, 1888: Dedication service of the Chapel - "free of debt". March 15, 1888: First preaching service in Chapel. June 2, 1914: Completed payments against parsonage mortgage. 1916: Contracts awarded for Church building totaling $36,000. Financed with $21,000 in borrowed funds, including a $15,000 mortgage. October 1, 1916: Cornerstone laying service for Church building. The cornerstone held names of 548 members and friends who contributed %526.00 toward the windows. May 20, 1917: Dedication service of the church building. March 20, 1919: Purchased property on Providence Avenue. 1929: Preliminary plans for new education building presented. 1939: Purchased property on Providence Avenue. June 29, 1941: Mortgage burning ceremony after 24 years of dedication. October 1946: Building Committee appointed. April 23, 1947: Purchased property on Providence Avenue. 1951: Purchased additional property on Providence Avenue. November 11, 1952: Demolition of old Chapel. December 23, 1952: Foundation began on new Chapel. April 9, 1953: New building financed with a 15 year, $75,000 mortgage. May 24, 1953: Cornerstone laying service for new Wood Memorial Chapel. The cornerstone held names of those contributing more than $1,300 toward the building fund. November 15, 1953: Opening and Consecration service of the Wood Memorial Chapel. January 9, 1966: Final payment made against mortgage, in less than 13 years. June 26, 1994: Celebration Service to mark the closing and deconsecration of Providence Avenue United Methodist Church, "God's Gift for a Season"
In the year 1883 the Spirit of God moved upon the hearts of a few men and women, members of Madison Street Methodist Episcopal Church, but who were living in what was then called North Chester, and revealed to them the need of a Methodist Church in that community. At first, prayer meetings were held in the homes of the community and on Sunday evening, October 11, 1883, the Reverend Peter Hunter preached at the first public service which was held in Borough Hall, Eighteenth Street, West of Providence Avenue. Services were held here until the erection of the present chapel. Application was made by the members of Madison Street Church living in North Chester for the creation of a new class and on January 13, 1886, the pastor Reverend Theodore Stevens appointed Joseph O. Wilson as class leader. During the summer of 1886, a plot of ground at Eighteenth Street and Providence Avenue was purchased for the building site and the erection of the new brick church edifice was begun that summer. At the annual conference of 1888, Bishop John S. Hurst appointed the Reverend Franklin M. Welsh as junior pastor of Madison Street Church and Providence Avenue Church. The first sermon was preached by the Reverend Mr. Welsh, Sunday morning, March 15, 1888. A board of trustees of the new Church was organized July 19, 1888 and consisted of D. Reese Esray, John N. Wilson, William S. Blakely, Joseph S. Hunter, Samuel Greenwood and Joseph O. Wilson. Mrs. Wilson was also the first Sunday School Superintendent. 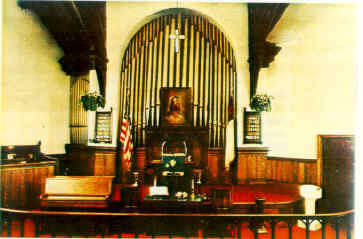 The Church was made an independent charge by the annual conference of 1890, and the Reverend D. S. Sherry was appointed as the first regular pastor. The first quarterly conference was held April 15, 1890, with the Reverend Thomas B. Neely presiding. During the pastorate of Reverend D. L. McCartney, a brick parsonage was built on the lot next to the church on Eighteenth Street. During the pastorate of the Reverend Frank J. Andrus, a building committee was appointed and plans approved for the first unit of a new church. Ground was broken for the new building in 1914. The service for the corner stone laying was held on October 1, 1916, and was conducted by the Reverend Dr. George W. Henson, the District Superintendent, assisted the the Reverend Dr. Frank J. Andrus and visiting ministers. The new gray stone church edifice was completed in the spring of 1917 and the dedication was held, Sunday, May 20, 1917. In 1919, when Reverend J. C. Bieri was pastor, a lot and a frame dwelling on Providence Avenue adjoining the church was purchased. On Palm Sunday, 1938, a bell in the tower was dedicated. It was the gift of Mr. and Mrs. Alexander Smith. Ceremonies at 5 p.m. tomorrow will mark the laying of the cornerstone for the new Educational Building of the Providence Avenue Methodist Church, 18th and Providence. The building will be known as the Wood Memorial Building, honoring the memory of Robert E. Wood Jr., who "gave his life in the interest of freedom during World War II" while aboard the submarine "Snook". He was a fire control man, 2nd class, and started his last patrol about the middle of March, 1945. Notification from the government was received by his parents May 14, 1945, as "missing in action." Tomorrow's service will be in charge of the pastor, Rev. William H. Anderman, and the stone will be set in place by Robert E. Wood Sr., father of the boy in whose memory the building is being erected. Arthur B. Lewis, trustee emeritus, and Edwin Emmott, also a trustee, will assist Mr. Wood. The old stone has been recut and refinished. William Rumford, the contractor and builder, and Allen Cullis, of John F. Cullis Sons, Stone Masons, will be there to aid. The stone will bear the lettering, Chapel 1888 and beneath it the following: Wood Memorial 1953. Sealed in a stainless steel box made by Charles Lantz, another trustee, to be placed in the stone will be a Bible, Hymnal, Methodist Discipline, Philadelphia Annual Conference Minutes, various Methodist periodicals, a 1953 half dollar, a returned letter sent to Robert Wood Jr., programs of the day, a brief history of the chapel and church, a church directory, a list of contributors, and a copy of the Chester Times and the Times Year Book. When the old building was demolished, two copies of the Chester Times were found in the corner stone, in poor condition but with the date quite readable. The service will begin at 5 p.m. Dr. Alexander K. Smith, district superintendent of the South District of the Philadelphia Conference of the Methodist Church will give the address. B. J. Williams, trustees' president, will relate the building program. The lower floor will be used for Nursery and Beginners Department work. The upstairs, which eventually will be made into a chapel, will be used at present for Bible School work, prayer meetings and social gatherings. What will later become a hallway connecting this building to the next unit, will be used now as a temporary kitchen. At the conclusion of the cornerstone laying service, Open House will be held at the parsonage from 6:30 to 9:30 p.m. The parsonage has been completely renovated throughout, making it a modern dwelling in every detail. The sanctuary has been completely renovated, the downstairs of the church building has been remodeled. Much of the work was done by volunteer labor from the congregation. At the morning worship, Dr. Leslie Ross, a member of the General Board of Evangelism with headquarters in Nashville, Tenn. will speak. Rev. Anderman was returned to the Providence Avenue Methodist Church for the 14th year at the recent Session of the Annual Conference in Philadelphia. Trustees of the church are Arthur B. Lewis, honorary trustee B. J. Williams, president Paul Schieck, secretary, Charles Hummer, Charles Lantz, Edwin Emmot, Howard Rowles, Charles Firth, Wilson Deysher, and Lester Thomas. The trustees have served as the building committee. Recollections: "I lived across the street from the church. My address was 204 E.18th St (I lived behind St. Robert's). My family moved there when I was born in 1963 & we stayed until 1975. My father, Richard Lyons, was a caretaker there for a few yrs (I don't remember the dates). He cut the grass & the hedges while Mr. Mitchell was the pastor. I also remember the Ihle's (their father was the pastor for a while - Gerald Ihle). I just wanted to let you know I remember that church very well. We used to play there every day. I also went to Vacation Bible school for a few summers. I went to St. Robert's for grade school then on to Notre Dame for High school. That was a great neighborhood then, we always had a great time just playing together." � 2000, 2001, 2002, 2006 John A. Bullock III.